Service Linen Supply has received statewide recognition for its environmental leadership by winning the Association of Washington Businesses 2012 Environmental Excellence Award at a ceremony at the Davenport Hotel in Spokane, WA on June 12th. The linen supply and uniform rental service company was honored for Environmental Excellence in Resource Conservation. The AWB’s Environmental Excellence Awards Program is a showcase for companies who successfully implemented programs that demonstrate initiative in the area of environmental protection. In its 20th year, the program focuses on actions that create a better environment, products that help environmental quality, and actions to prevent or reduce environmental problems as well as conserve resources. A critical part of Service Linen’s environmental stewardship is its revolutionary new Milnor CBW® washer with Pulse Flow which is designed to reduce its water use by up to 20 million gallons a year. In May, Service Linen Supply received one of the first TRSA Clean Green Certifications which recognizes linen rental companies that demonstrate responsible leadership in sustainability and conservation to protect the environment. Service Linen Supply is also a founding member of the Laundry ESP (Laundry Environmental Stewardship Program) which utilizes community partnerships to help reduce its commercial laundry’s water, energy, and washroom detergent usage. It is also proud to be a founding participant of the new Eastside Green Business Challenge, which is a friendly competition among businesses and non-profit organizations to see who can save the most money and natural resources in one year. 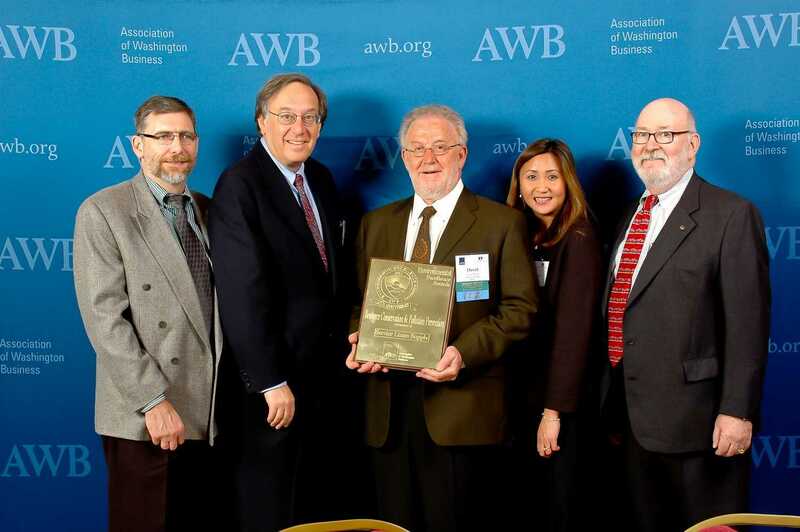 Formed in 1904, the Association of Washington Business is Washington’s oldest and largest statewide business association, and includes more than 7,800 members representing 700,000 employees. AWB serves as both the state’s chamber of commerce and the manufacturing and technology association. For more about AWB, visit http://www.awb.org/. Service Linen Supply is a family-owned local business that has been serving the Pacific Northwest’s linen service and uniform rental needs for over 65 years. Renton Laundry was founded on the current site in the early 1900’s. The business was purchased by the current ownership in 1946. Service Linen employs more than 130 team members who serve more than 3000 restaurants, medical facilities and other businesses in Washington and Oregon. With a focus on clean, green initiatives, the Service Linen team has traveled the world to discover the latest laundering technologies for efficiency and productivity. Attachment: Luncheon Award Photo; pictured from left to right from Service Linen, Jerry Fry, Vice President of Operations; Bob Raphael, Co-President; David Jassny, Co-President; LeAnh Mai, Human Resources Manager; and from Pellerin Milnor, Michael Dineen, Vice President.